Linux Mint comes pre-installed with tons of great, free software. 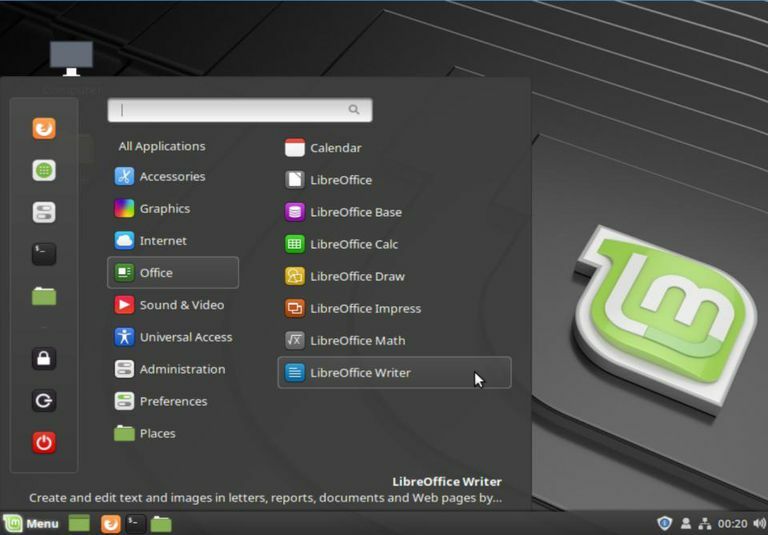 Installing Linux Mint on your PC or Mac opens up a whole range of new open source software and capabilities. It involves some initial preparation, but in the end you'll find it worth the investment. Prepare an installer. This is typically a USB drive, although you can also burn it to an optical disc if you're old school. Note however that most Linux installers these days are larger than a CD-ROM (700 MB), so you'll need a DVD-R/RW or a thumb drive of the appropriate size. Linux Mint's installer is nearly 2 GB, so plan ahead. Next, boot from the media (USB drive or optical disc) you just created. You may need to adjust your machine's settings related to boot order, as well as UEFI (more on these later). Finally, run the installer once the USB drive boots, and you arrive on a live Mint desktop (but feel free to have a look around first). While there are some computers that come with Linux Mint pre-installed, it's much more likely you'll be installing it onto a machine that already has an operating system. There's two approaches you could take: either install it over your existing OS, effectively deleting it, or install it alongside the original OS. Each comes with its own pros and cons. Straight Installation: Before you install Linux Mint over your existing OS, make sure you've identified alternatives for all the applications you need. You'll have no problem finding apps like browsers, office suites, or media players. But if you need a very specific program, you'll need to run the other OS is a virtual machine. Your computer should have a good deal of RAM (at least 8 GB) to support these two running at once. Dual-Booting: Dual-booting is having two OSes installed on the same computer, but only using one of them at a time. This approach sacrifices flexibility; in order to use the apps of one OS, you'll need to shut down the other. Also, dual-booting requires splitting your hard drive into partitions, effectively cutting off a section of its storage off from each OS. In this article, we assume you'll want to use Linux Mint as the only operating system on your computer. If you want to keep another OS in addition to Mint and dual boot, refer to our guides for setting this up on a Mac or a Windows PC. Once you've decided on your approach, we can put the installer together. The most convenient way to prepare an installer for Linux Mint is to download an image and write it to a USB thumb drive. Thumb drives are cheap, and make excellent portable toolkits once your Linux Mint install is done. Cinnamon is a fork of the GNOME Desktop (we compared the Ubuntu Unity desktop and GNOME previously). The Linux Mint developers started once GNOME 3 took a different approach to desktop layout. The philosophy of the MATE desktop is similar, although these developers decided to use version 2 of the GNOME desktop as their base. XFCE has long been the desktop of choice for older, lower-powered hardware. Layout conventions: All three of these desktops use a familiar layout, which includes an application launcher, taskbar, and system tray. Each also supports desktop icons. But their arrangement is slightly different among them, so check them out and see which one you like best. Default Applications: Desktop environments are called such because they aren't just the background surface that holds your icons. They include utilities like file managers and text editors as well. Check out each option and see if there's a "must-have" among the apps they provide. Aesthetics: The desktop environment represents the look-and-feel through which you'll interact with your computer. If it's functional but ugly, the result will be a less-than-ideal experience. Choose a desktop environment you like, keeping in mind that you can install alternate themes. Once you've selected a version, download its ISO file from the Linux Mint site, selecting the 32- or 64-bit version depending on your machine's processor. Don't know which one you have? If you're on a reasonably modern Mac, it will be 64-bit. For Windows, if you're unsure follow this guide to confirm which of these you'll need. Once you have a copy of Linux Mint, you'll need to write it to a USB drive. This process isn't as simple as copying the ISO file to the thumb drive. It will basically set the thumb drive up as a bootable hard disk, so your computer can run the operating system from it. One popular option is the Win32 Disc Imager. We've covered this in the past, so you can simply follow these steps to make a bootable Linux Mint thumb drive! Once complete you'll have an install drive that will boot on PCs protected by the Unified Extensible Firmware Interface (UEFI), which most modern machines use by default. The write process is as easy as selecting the ISO file you downloaded in the Image File field, and selecting the drive letter for your USB drive in the Drive drop-down. On macOS, the Etcher,io provides a similarly easy way to burn an image. With just three button presses you select your image, the USB drive, and start the write process. With the completed installer in hand, it's time for you to close all those apps and reboot into Linux land. Firstly, changes you make (like creating documents) won't be saved. The next time you use the drive, it will be reset to its original state. Also, running an OS from a USB drive is slower than from a hard drive, so don't judge Linux Mint's performance based on this experience. When you're ready to take the plunge, double-click on the Install Linux Mint icon on the desktop to kick off the process. The installer wizard will set up Linux Mint on your machine in just a few steps. The first step is to select your language – this is the language that the installed OS will use. You can of course change this later. Next, select your keyboard type. You can use the text box below to ensure keys are registering correctly. The following screen will ask if you want to install proprietary software. You'll most likely want to select this so you can play different types of media files (like MP3 files). The installer will provide you with a couple of options for where it will install Mint. Select Erase disk and install Linux Mint to use your entire hard drive, but be aware that it will then permanently delete everything on that drive. So again, make sure you have all your important data backed up. You can also choose to encrypt your whole OS on this screen or use the Logical Volume Manager (a Linux system for efficiently managing data on the hard drive). Both are safe to either enable or leave disabled, but keep in mind if you encrypt your OS you may experience a minor performance hit. If you have another OS (e.g. macOS) on the drive that you want to keep, you'll need to select the last option, Something else. This will allow you to manually select where Mint will install from among your hard drive's partitions. Re-visit the guides for dual booting on a Mac or a Windows PC for instructions on which partition you should choose. The installer should correctly guess your timezone based on location. At this point the wizard will ask you a couple more questions while the install starts. First is your timezone, which the installer will probably guess correctly based on your location. Set your credentials, identifiers, and the option to encrypt your files. Finally, you'll be prompted to enter your full name, a user name, a computer name (how it shows up on the local network), and a password. You'll also have the option to encrypt your personal folder, which you should do if you didn't encrypt the OS as a whole. You can finally relax now while the install finishes. The installer will show you some slides describing features of Linux Mint while things wrap up. Once complete, you'll be prompted to reboot your PC. Click the Restart Now button, and remove the USB drive with the installer. After the restart, you'll land on a screen where you can log in with the username and password you created earlier. Congratulations, your Linux Mint desktop is now ready to enjoy!